Some day, few things confuse me completely, leave me dumbfounded. It leaves me shaken violently and teach me to see the world with new eyes. Today this question is revolving around my head, 'What is my function then?' Why I am traveling in this planet? I came without my concent, I will leave in the same fashion; and whatever days I will live are also not that different. I am tired of my wrong role play in this drama of life, really tired. "Holing the railing of this almost ruined bridge each day pass away, clumsily." I dont get this injustice. Where I live, there are about few hundred thousands of people also live; but why me? Why I am made to face such things? Mentally handicaped this child of age 4 was roaming around the street. All over his body he caries sign of beating. Due to my identity as a write, people have come forward to request me to make a report to the newspaper as 'lost-child' case. See, they could have easily done this by themselves, there is no connection of my being a writer. By getting hold of few juniors who work with the newspaper, I arranged to report this. But no body showed up for this child! Now what? 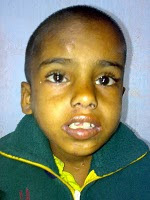 Everyone in unambiguous voice is declaring that the child should be again left at the rail station where he was found. What?! Is he a cat or dog that he deserve such treatment! Some said, if kept, there might be problem related to police! Someone might complaints, and this is not strage that the internal organs of this child has been stolen etc. This country is really strange! If someone is dying on the street and suffering in a pool of blood, even then no one will come forward out of fear of police. If some brave person take him to hospital, even then the doctor wont come forward with treatment unless the police is informed. Strage, strage! The police station didnt want to take any responsibility of this child, not even the peoples' representative of the locality. Whats interesting is that the representative have access of social welfare and other ministries. If so many government agencies can not take care of a single child, then whats the point of giving so much tax, I wonder! Where is emotion in crude reality? To keep this child in my custody is no joke. Today my own house is almost non-existent in storm. When this mentally handicaped (special) child's bowl's movement will be left unattended, then everyone at home will become irritated. When he will tear all my papers for writing spread around, wont I be irritated? My own circle of people knows me as someone who is heartless. They will never know that everyone cries, some cry in day light, some cries in the dark corner of the bathroom. Yet still, some dont have the ability to cry. They are the most unfortunate in the world. I can't possibly look into the eyes of the child, his look is so intense! I dont have the power to do that. To make a home for such child, one doesnt need to be a millionaire. If there are about 10-12 thousand taka, one can give shelter to 10/15 of such child easily. I blame myself. People like myself have come with only to consume and to release, nothing else. Today I am very angry at my own shortcomings. I curse myself, today. Dont I want to become like other people, indifferent! I am waiting for that day to come when I will leave this child again at the station platform!